Note that this is not a copy of any other articles! Written mostly from memory, but with some references. After World War 2, the British Admiralty wanted to change to diesel engines for their smaller vessels, as a safer and reliable alternative to petrol engines. D. Napier & Sons got the contract to come up with something. Napier had a reputation for unusual and impressive engines such as the Sabre aero-engine. Before the war, they had produced some Yunkers diesel aero-engines under licence. These were opposed-piston 2-stroke units. Yunkers had later created a square cylinder arrangement with 4 banks of cylinders. Napier came up with a better version with 3 banks of cylinders in a triangular arrangement. This produced a more rigid (and thus lighter) structure. With 18 cylinders (36 pistons), it had a short stroke permitting high revs and therefore high power. A smaller 9 cylinder version was also produced. This "Deltic" engine was publicly launched in 1953, as a 2,500hp unit for fast patrol boats. In down-rated form, it was used for mine-sweepers and other vessels. Alternative applications for Deltic engines were quickly found, such as small electricity generating stations. A write-up in a 1953 issue of "Model Engineer" magazine suggested a railway application would be ideal. By 1954, a prototype Deltic locomotive was under construction in Preston. Napier was part of the English Electric (EE) empire who were already busy exporting diesel-electric and electric locos. They were well placed to supply British Railways once the modernisation plan got under way in the late 1950s. EE produced a series of conventional diesel engines for their locos in a choice of V8, V12 and V16 cylinder form. 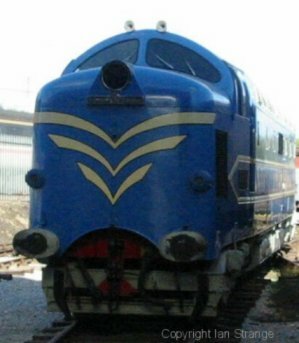 The Deltic powered prototype loco was simply named "Deltic". This was a classic example of the old way of showing off to potential customers what could be done - albeit at great expense! Deltic was the world's most powerful diesel loco, but more impressive was that it was also much lighter and smaller than its rivals around the world. This made it ideal for fast passenger work, since light weight helps to reduce wear and damage to trackwork. It was fitted with 2 Deltic engines giving a total bhp of 3,300. Power at the wheel-rims was over 2,600 across a wide speed range. Total weight was 106 tons. It was way lighter and more powerful than anything even on the drawing-board for Britain's railways. The Deltic engines were built in Liverpool, and "Deltic" entered service running between Liverpool and London Euston. It also underwent some detailed performance tests. Although "Deltic" had amazing potential, it was also far more expensive than conventional diesel locos, both to purchase and to maintain. It was extravagant, much like buying oneself an exotic sportscar! Meanwhile, the rail bosses had their eyes on electrification, but this was an enormous investment likely to take many years to fully benefit from. The West Coast Main Line got an early go-ahead for its southern half, with the northern half to follow in a few years. The East Coast Main Line was left with the prospect of diesel haulage for many years. Conventional diesels could out-perform steam on shorter start-stop services, but for longer express runs, there was little prospect of improved speeds over the best steam traction. 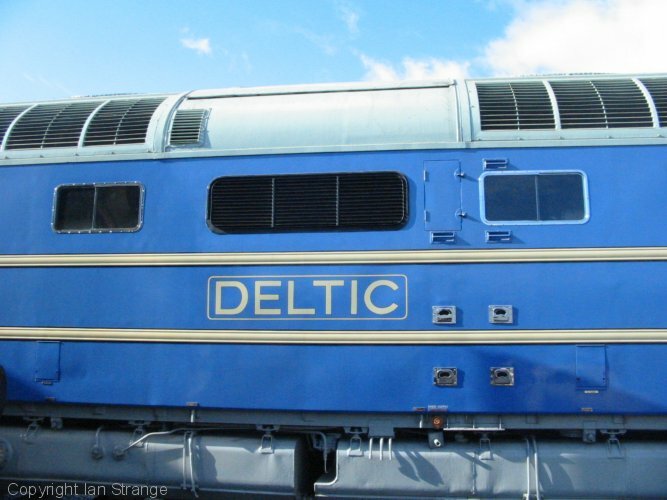 Enter "Deltic", which moved to the Eastern Region in the late 1950s. The issue was not just a question of loco performance. A major by-word of the day was "availability". This was where diesels had a big edge over steam, since they were available for duties for, typically, 75 percent of the time. Deltics had even better availability. Their engines could not be overhauled in situ, and needed to be removed. But since they were relatively small and light, they could be quickly swapped for overhauled engines, and the loco sent straight back to work. This meant really intensive use was possible, and only 22 production Deltics were needed to replace 55 steam engines, keeping down the costs and making this fleet viable. Railway management were understandably apprehensive of anything unusual and untried. It was G. F. Fiennes (ref. 1) who pushed through the case for Deltics, with BR management. He argued effectively about the competition from the A1 road, as a dual-carriageway, and that longer haul train services needed to average over 75mph to bring back passengers to rail travel. Running parallel to this story, was the tale of the Baby Deltics. Initially, BR ordered batches of 10 locos from various manufacturers for evaluation. In 1959, a batch of 10 small 1,100bhp locos were built fitted with a single 9 cylinder Deltic, turbo-charged. It was probably just as well that the order for the larger Deltics was already in, because these Babies gave a bad impression of themselves! However, it was not usually the 9 cylinder engines themselves that were at fault. The locos had an unusual design of mechanical drive from the engine to the various auxiliaries. When this broke, the shafts flailed around and broke hoses on the engine, causing serious engine damage. A subsequent modification eliminated that flaw, but the low power tended to defeat the object of fitting an expensive Deltic engine, and they were phased out of service after a decade or so and all scrapped. As EE designed and constructed various loco classes, they got into rows with BR over requests (by BR) for changes and extra features. Some of these features were ill-conceived and quickly abandoned. For example, gangway doors at the loco ends. With the Deltics, EE won their arguments. Gangway doors were not added. 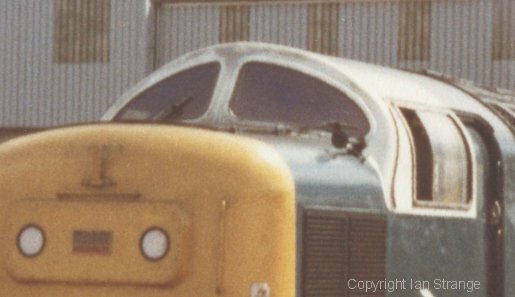 BR also wanted to restyle the loco bodies, claiming that "Deltic" looked too old-fashioned. BR did succeed in getting a last minute small modification added to the first production Deltic, no. D9000. This was a high power xenon flashing headlight just above the buffer-beam. This was soon removed, and you can still see the alternative style of nose foot-step where the lamps were removed. The production Deltics entered service during 1961-62 and were numbered D9000 to D9021. Unlike the Prototype, the fleet were constructed at Vulcan Foundry at Newton-le-Willows. They were divided between 3 maintenance depots: The new diesel depot at Finsbury Park in North London, Gateshead at Newcastle, and Haymarket, Edinburgh. The Finsbury Park locos were named after famous racehorses. Gateshead named theirs after north-east English regiments. Haymarket named theirs after Scottish regiments. Not a period photo (actually 1994), but it shows the original livery for production Deltics. Meanwhile, the Prototype Deltic was retired, as there were too many modifications needed to bring it up to the production loco spec. It had vacuum brakes only, and the loading-gauge of its body meant it had some unhappy brushes with platform edges! It had series 1 engines, which were very different from the series 2s fitted to the production fleet. So, the Prototype was donated to the London Science Museum in 1963, after having major engine parts removed, and it stayed there for 30 years. The Deltics were designed for 100mph running, but initially the line speed had a 90mph limit. The Deltics' strongest attribute was their power, for acceleration and maintaining speed up gradients. Part of the deal to buy the Deltics was that EE would carry out maintenance and overhauls initially. With penalty clauses in the contract, the Deltics' availability in those early years got as high as 97 percent. There were plenty of teething troubles to start with, but reliability improved quickly. Having built the 2000hp class 40 locos with their V16 engine, EE were developing a more powerful 2700hp version. Their need for a prototype loco occurred while the Deltics were under construction, so they used a Deltic frame/super-structure to install the uprated V16, with modifications as required. This loco was known as DP2. It ran successfully until suffering a major crash in 1967 after which it was scrapped. An early problem with the fleet was cracks in the bogies. These had fabricated frames, and the high speed punishment was too much for them. The same design was fitted to the class 37s, although the problem was less severe for them. Reinforcements were tried but with limited success. DP2 was later fitted with an improved version which had cast headstocks, and many of this bogie design were then fitted to class 37s. The ultimate solution came when cast bogie frames were introduced in 1965 for the whole Deltic fleet, plus some for the 37s. This added a bit of weight, and by the 1970s, with other modifications too, Deltics were weighing in at around 106 tons (originally 99 tons). Another Spanner in the works! A legacy of the steam age was that diesels had to heat carriages with steam right into the 1980s. The boilers installed in the new locos were not designed for bouncing around in such arduous conditions! Deltics were fitted with the Spanner Mark 2 boiler. A large proportion of diesel loco "failures" were actually the result of boiler trouble. Other boilers were tried in Deltics, but ultimately, a number of detail improvements largely resolved this "head-ache". Napier's brochure for their range of Deltic engines, included some more powerful options for rail traction. There was the turbo-charged 2,200bhp version and the charge-cooled 2,500bhp Deltic. That meant the prospect of a 4,400 or even a 5,000bhp Super Deltic! The charge-cooled engine was much heavier though, and probably unsuitable for a high-speed loco, unless the 2 engines were divided between 2 vehicles in the style of the Blue Pullman and HSTs. The Super Deltic could have hauled services along the northern half of the West Coast Main Line prior to electrification. In the event, class 50s working in pairs performed this task. Although sad not to see Super Deltics in reality, the class 50 option was logical, since they could later be deployed elsewhere working singly. The take over of English Electric by GEC in the late 1960s caused a major upheaval. Manufacture of Deltic engines moved to Paxman Diesels of Colchester. BR were told to take on engine overhaul themselves, although Napier assisted in the transition. It is a measure of how specialised Deltics are, that British Rail Engineering Limited (BREL) at Doncaster Works, ran into difficulties. So much so that at one point, half the 22 strong fleet were 'grounded' a year or so after the change-over. One of the biggest issues was fractured cylinder liners. This was an old on-going issue, but it escalated alarmingly by late 1970. Other troubles included leaking liner seals and broken quill-shafts (hollow driveshafts) that link the crankshafts to the phasing gears. Enter Ray Smith (ref. 2), a senior locomotive engineer at Doncaster who was the third generation of his family to be associated with that Works, through the steam age. He cited his work with Deltics to be the most rewarding. He was chairman of the Power Units Sub-Committee who had the challenge of solving any reliability issues. Or at least, co-ordinating the enormous technical challenges with the help of the design engineers at BR Derby, and Derby's Research Centre, plus Paxman Diesels' engineers. Those challenging technical problems were brought under control, and loco availability recovered. Most impressive is that the engine hours between overhauls was progressively increased. When new, the target was 4000 hours, with plans to increase to 5000. That latter figure was the initial target for BR when Doncaster took on the overhauls. 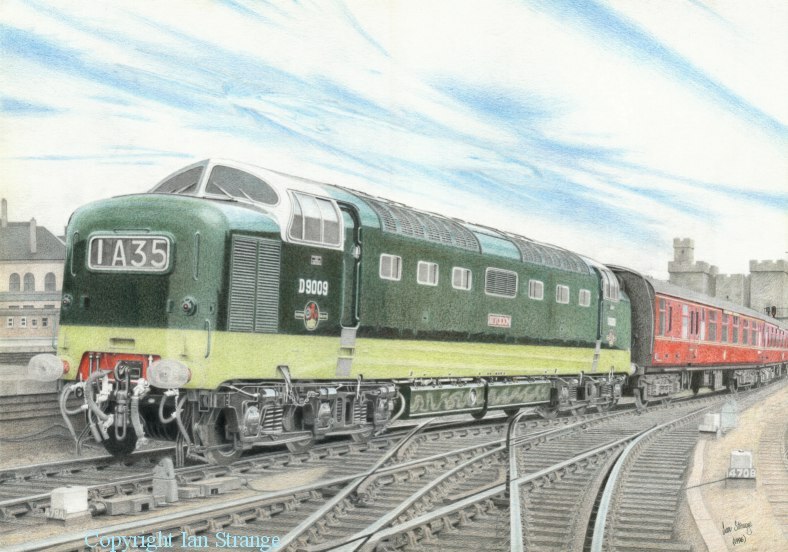 The intensive use of the Deltics meant they created an excellent research and development exercise that exceeded any other applications for Deltic power-plants. Ultimately, engine hours reached as high as 7500 between strip-down, late in their careers, as improved component designs worked well. Electric Train Heating (ETH) for new coaching stock had to be supplied by the loco. Other diesel locos had their auxiliary generators replaced with new versions to take on the additional task, but there were technical reasons why Deltics could not follow suit. There was no room for a generator set, unless the steam heat boiler could be dispensed with, but steam-heat sleeping cars were to remain in service for some years. You could not simply wire up the heating to the main generators, since these produced varying voltages as the engines rev. This coincided with a programme of rewiring the Deltic fleet, and the design engineers came up with an ingenious solution. ETH supply would come off both main generators (these generators are in series) when the engines are idling, but with the generator fields at full excitation . Also the idling speed of the engines would be increased from 650 to 700rpm. When the driver applies power, the ETH would switch over to the main generator nearest the driver, and the controls were altered so that the leading engine would rev up first. Thus, the voltage to the ETH would pick up quickly. Once the driver needed full power, the final travel of the power-handle would cause the trailing engine to rev up quickly. Shortly afterwards, mark 2D air-conditioned coaches appeared. The ETH from the loco supplied motor-alternator sets on each coach, and this introduced more teething troubles to challenge the engineers. Mark 2E coaches were banned from working with Deltics. With the worst of the engine problems under control, upgrades to the ECML speeding up the route, and nice shiny new coaches, the Deltics were able to show their full potential. The only slight downside was that the air-conditioned coaches sapped a big chunk of the loco's power. A curious reference to Deltics in the press was in a Yorkshire newspaper supplement "Railways in the Ridings" (circa 1974). In a colour centre page spread, the headline read: "Meet the Supertrains". We were shown the experimental Advanced Passenger Train (APT-E), designed to do 155mph on conventional track. Also, the prototype High Speed Train (HST) - 125mph, representing the ultimate in conventional technology. And finally... a photo of a Deltic hauling the "Flying Scotsman"... the most powerful diesel loco in British Rail service. More details about Deltic performance can be found in a separate article How Fast is a Deltic? 1 - Deltics, along with class 40s and prototype DP2, were fitted with water-scoops to take on carriage heating water from troughs used by steam locos. The scoops were removed after the demise of steam traction. 2 - Deltics had their sanding-gear removed in the 1970s. The change in the engine controls following the ETH conversion, meant that wheel-slip was rarely a problem. 3 - Deltics had a neat toilet/wash-basin installation inside one of the noses, but this was removed when the air-brake conversion took place in the late 1960s. 4 - 55010 made it into the record books for covering 2 million miles in less than 11 years. The Deltics ran up huge mileages, but hard working fast miles. Most exceeded 3 million miles during their 20-21 year careers. By the mid 1970s, the locomotives' bodywork were giving cause for concern, as cracks appeared and rust became evident. In an effort to extend their lives into the 1980s, 55016 was taken into Doncaster Works for a Heavy General Repair (HGR). Extensive body repairs were carried out, partly as an exploratory exercise to see how good or bad the condition was. The opportunity was also taken to make some detail improvements. One visible change was the removal of the cabside quarter-light windows which were then plated over. This reinforced a region that was prone to cracking, since the weight of the noses had been bouncing around for many years, over-stressing small areas of stress-concentration. Other visible changes were plating over the redundant route-indicator boxes, and removing the aluminium hatches for filling the sanding gear, and plating them over. A small number of other Deltics had HGRs, but less extensive. The project was abandoned once the projected life-span of the fleet was shortened to the early 1980s. But many of those small mods were carried out on the others. 55020 escaped those changes because it was withdrawn early, while 55008 and 55022 did not have the route-indicators plated over. Plenty of TV publicity followed the entry into service of the world's fastest diesels, the High Speed Train (HST), marketed as the Intercity 125. BR had long wanted to have a standardised express passenger train, making maintenance and operation a lot simpler. They were introduced to the ECML in 1978 and the Deltics were demoted to so-called semi-fast duties. Those Deltics based at Haymarket and Gateshead, were transferred to York, because most of their running was to be between York and London. This move prompted a local campaign in York against the Deltics by folk living next to the line to the south of the station. Buying a house or flat by a railway and then complaining about the trains, might sound a bit daft! But the problem was that Deltics emit clouds of lubrication oil at the start of a journey, which gradually clears, as long as the loco is working hard. That start of journey "smoke-out", had moved to York. The campaign persuaded BR to request drivers to "tip-toe" passed these residents before opening up to full power. Ironically, that gentle start simply made them more smoky once they did open up! Surprisingly, this period produced some of the best high speed performances. With the line upgraded for HSTs, drivers were more likely to exceed the 100mph limit (on the locos and coaches), when running late. At that time, BR had an appalling policy of reducing maintenance (other than safety related) on locos that were to be phased out. They would then wait for each to suffer a serious breakdown and then withdraw it from service. I'm sure that the passengers who were inconvenienced, did not appreciate that. What happened more often, was that minor breakdowns would occur, fixed by the crew, causing delays and frustration for staff and passengers alike. Yet it was a good time to be an enthusiast. While the public image of the Deltics suffered, many drivers drove them hard. The exhausts often became very loud, and the appearance often battle-scarred and shabby. They looked and sounded mean, but still performed! One little boost to the aesthetics, was the application of white paint around the cab window areas of the "Racehorse" Deltics. This was a nice touch by Finsbury Park depot, bringing back a livery detail from the original livery scheme, before the standardised corporate blue took over. It seems very inconsequential now, but in those days, the standard livery was strictly enforced. No independent artistic creations were permitted! The first 2 casualties were 55001 "St. Paddy" and 55020 "Nimbus". These had been laid up in Doncaster awaiting power-units (engine-generator sets) during 1978/9 until the decision was taken to scrap them. This was part of the plan to scrap a few of them prior to the summer 1981 busy timetable. Then in autumn, they would be quickly phased out. 55003 "Meld" was next to go in late 1980, and then February 1981 saw 55005 and 55006 end their careers. 55012 "Crepello" followed in May. In June 1981, the Finsbury Park based "Racehorse" Deltics were transferred to York depot, as a precursor to closing down Finsbury Park depot. York became nicknamed "Deltic City", and York coat of arms stickers were applied to the surviving locos. The distinctive white cab feature was removed (although occasionally reapplied to 55015 for railtours). Reliability held up well, despite the above mentioned policy, and quite a few of the fleet were still running at the end of December 1981, the official end of the Deltic era. In 1977, the final railtour for the Westerns took the steam chappies by surprise at the sheer level of interest and enthusiasm. This surprise was expressed in the editorial of the May issue of Railway Magazine that year. The editor added that he still did not think the demise of the Deltics would raise the same level of interest!!! All that was missing was some canned laughter! Enthusiast railtours for Deltics were already in evidence in the late 1970s. By the final 1981 season, there never seemed to be enough tours to cope with demand, all over the UK. By the autumn, the appearance of a Deltic on a scheduled service, brought photographers out of the woodwork. Plus youngsters hastily making nameplate rubbings, others asking to �cab it�, not forgetting sound recordists like me. Drivers enjoyed superstar status reflected in the Deltic�s glory. Not only did the Deltic fleet have a cult following, but each individual Deltic had its own fans. Railtours became even more intensive that autumn. On 28th November 1981, there were 3 such enthusiast specials simultaneously. 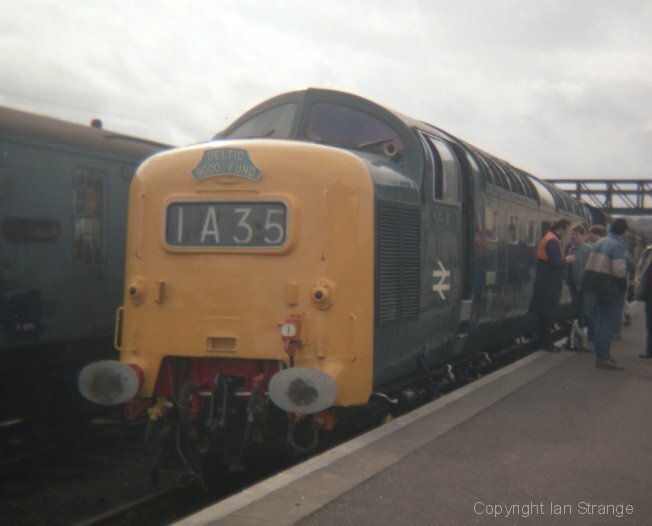 These included two well remembered tours: 55022 on the �Deltic Venturer� which included a climb of the Lickey Incline after dark, and 55016 hauling the �Deltic Devonian� special with some enthusiastic driving and conquering the Devon banks. 31st December 1981 marked the final day of ordinary service trains hauled by Deltics. 55017 �The Durham Light Infantry�, hauled the final departure from Kings Cross in front of local TV cameras. It carried headboards and a wreath � and probably more enthusiasts than commuters! Its service had to be terminated at Grantham due to a broken rail causing chaos on the line. Enthusiasts hopped aboard a service into Kings Cross hauled by 55015 �Tulyar�, expected to be the last Deltic into �The Cross� that day. It was decided to run 55017 back into Kings Cross as an additional working, but it ran into difficulty enroute. Down to running on 1 engine by Stevenage, it�s control circuit-breaker tripped and stopped the train and it did not travel much further. Meanwhile 55019 hauled the last service train from Edinburgh to York. 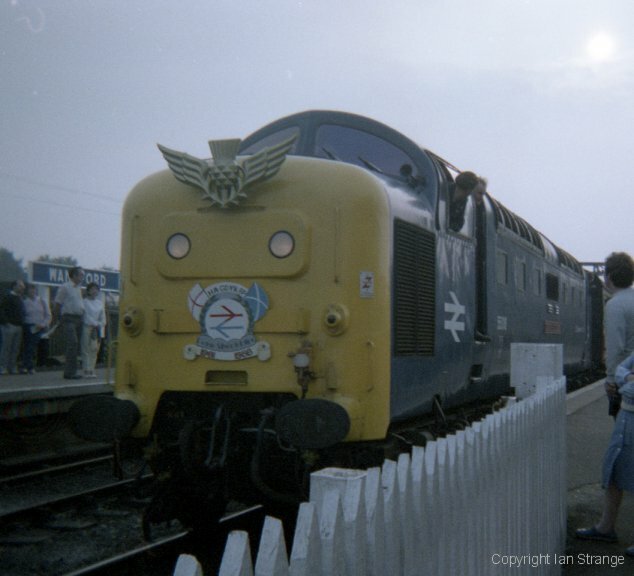 Tickets for the final railtour (�Deltic Scotsman Farewell�) were all snapped up months in advance and this run took place on 2nd January 1982. 55015 took the outward leg, Kings Cross to Edinburgh and 55022 brought the return leg back. 55009 ran light as a back-up loco, running ahead of the tour between Peterborough and Newcastle. Unprecedented at the time, was the presence of BBC and ITN news cameras at Kings Cross, to see off the tour, interview a driver and youngsters. As one journalist commented, �� they were virtually hanging from the rafters trying to get a glimpse�. The crowds turned out all along the 393 mile route. The TV news crews were back at Kings Cross in the evening to see the triumphant arrival, horns blaring, crowds chanting, and tears wiped from eyes. It was emotional scenes that took even enthusiasts by surprise, with about 40 minutes crammed with spontaneous behaviour. One gent on his knees kissing the loco (as seen on TV). The driver restarting the engines to work up the crowd. Horns blasting. Three cheers for the drivers� like a mad, surreal fantasy. It was the end of a hobby. In 1977, the "Deltic Locomotive Society" appeared. No... I haven't got the title muddled! (Ref. 3). The founders were worried that the National Railway Museum (NRM) were not interested in acquiring a Deltic for preservation. Soon afterwards, it emerged that the NRM were to save an example, so the DLS was disbanded. In that same year, the "Deltic Preservation Society" was formed. The founders had great foresight at a time when railway preservation usually meant steam. They were joined by some illustrious names from the Deltic world, including the afore-mentioned Ray Smith. 55016 was their preferred candidate to save since it had had the HGR described above. 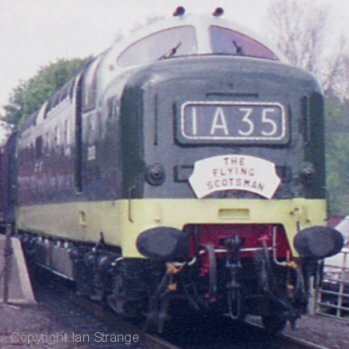 When this Deltic suffered a fire before withdrawal, they changed their choice to 55019 "Royal Highland Fusilier". With enthusiasm and society membership building up so fast, a fund to save a racehorse Deltic was started, as these locos had a strong following. It was so successful, that 55009 "Alycidon" was purchased at the same time and handed over to the society along with 55019 in August 1982. They also purchased 5 spare power units. These 2 Deltics became based at the North Yorkshire Moors Railway. By 1999, they were back on the main line for luxury specials and railtours, and subsequently the DPS built their own depot at Barrow Hill to safely accommodate their fleet and spare parts. And an impressive and professional looking place it is! A separate group also formed as the Deltic farewell approached: Deltic 9000 Fund. This was a large group of share-holders who wanted to save the pioneer production Deltic, D9000 (55022), "Royal Scots Grey". They took delivery of their prize possession in 1983. They also set their sights on fire-damaged 55016 "Gordon Highlander" and this was restored to running order by 1985. Both of their Deltics went to the Nene Valley Railway. Subsequently, D9000 became the first Deltic to return to the main line in 1996, and by 1997 it started working scheduled service trains on a regular basis (availability 100 percent!) plus some VSOE Pullman excursions. After some setbacks, 55016 also took to the main line in 2002. Both locos have since changed ownership more than once. 55015 "Tulyar" had an unusual path into preservation. BR decided to try and auction the loco, alongside a sale of railwayana including Deltic nameplates. But at that time, many enthusiasts were still teenagers, and our pocket money did not stretch to a �5,000 locomotive! It failed to sell. 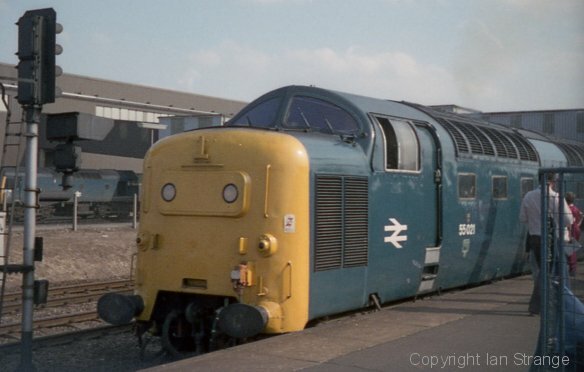 There were rumours that it might be a back-up loco for the nuclear flask crash test, that saw class 46 no. 46009 go out with a bang, on TV. 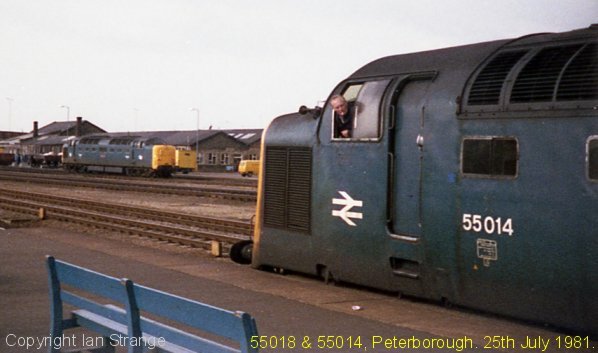 55015 then went to Derby to analyse the wheel-to-rail forces of a Deltic, which became known as the "Deltic Criterion". Thankfully, someone came to the rescue and purchased this Deltic for preservation (Peter Sansom). He moved it to the Midland Railway Centre. After a couple of years, he sold it to the DPS, and ultimately it became part of the fleet housed at Barrow Hill. 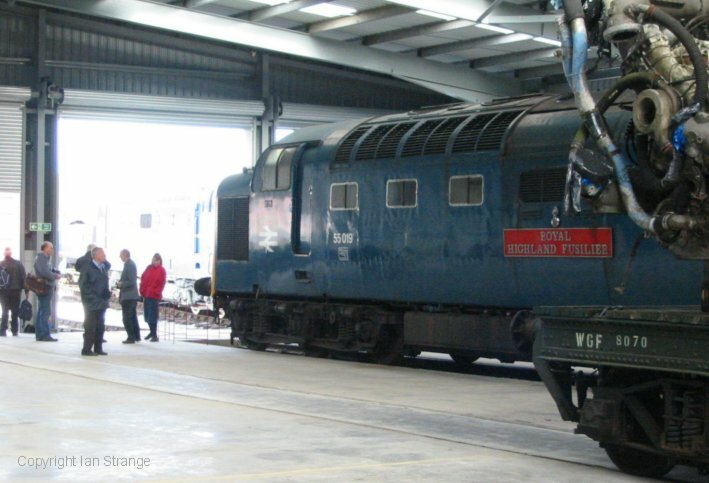 York NRM chose a Deltic with a name associated with Yorkshire, 55002 �The King's Own Yorkshire Light Infantry�. To mark this decision, 55002 was repainted into 2-tone green in late 1980. Meanwhile, 55005 was ear-marked as a reserve choice, and although withdrawn in early 1981, it escaped the cutter's torch for over a year. 55002 made its main line railtour debut in 2014. The Prototype Deltic, as mentioned earlier, went to the then new Science Museum in London way back in 1963. It is remarkable because it is almost like having something preserved in a time-vessel, with no further modifications for decades. It has series 1 Deltic engines of a type made specially for this loco (it had one spare engine, but that was scrapped as far as I know). By 1993, the museum managed to extract this loco from its long-term home, since they preferred to have cut-away educational exhibits. It moved to the museum at York, and subsequently to Shildon. Major engine components had been removed in the early 1960s so that it is unable to run. With different engines - and exhaust systems - to the production Deltics, it would be interesting to hear it. During 1999, D9000 was having a roaring success hauling service trains as well as specials. But its riding engineer Chris Wayman was irritated by negative comments by a railway journalist. So, as a kind of April Fool gag, Chris fed the journalist a spoof story to see if he fell for it. He did! The story was that Chris planned to build a replica Baby Deltic around the 1 surviving power-unit. However, the gag back-fired... in the nicest possible way. Interest from readers flooded in, turning the fairy-tale into a story that might have a genuine happy ending. Chris was too busy that summer looking after D9000, but when he left DNLL in September, he and I discussed starting the Baby Deltic Project, based around the 9 cylinder engine that was lying outside York NRM. Then he called me before Christmas to report that the NRM planned to scrap the engine if he does not buy it by the year's end. I was tempted to buy it myself, but it was a stretch, so I spoke to an enthusiast friend who was happy to become the latest Deltic owner. As the artist in residence, I drew the above emblem for the proposed project in January 2000. Note that this is not connected with the current project of the same name. Provisional plans for the project involved using a class 20 as a test-bed for getting the power-unit up and running. Class 20s share the same bogies as the Baby Deltic. We were offered expert support for the engine rebuild. Chris had useful contacts that would enable body parts, fittings, windscreen etc. to be made for the replica loco body, in the longer term. Unfortunately, Chris's circumstances prevented any action, and the power-unit remained at the museum. After several months, the NRM asked the owner if he would be willing to sell it back, since there was another party interested. The 3 of us agreed, on condition that the engine was going to be preserved. 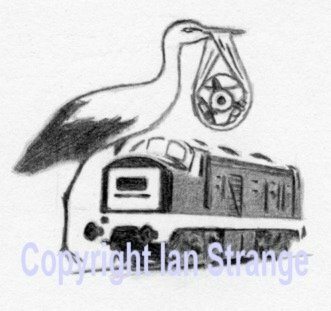 And so, a new project got under way with new owners, also called the Baby Deltic Project, at Barrow Hill. As many enthusiasts know, the Baby Deltic engine was brought back to life, using a class 37 as a test-bed, and the project involves modifying the loco to resemble the original class 23 locos. Quite an impressive challenge! The nature of the Deltic engines makes the long-term preservation a big and expensive challenge. But problems are there to be solved. Long may the hard-working preservationists keep the Deltic roar alive! 1 - "The Deltics - A Symposium", chapter "British Railways buy the Deltics" by G. F. Fiennes. Published by Ian Allan, 1972. 2 - Ray Smith's series of articles published in the journal of the Deltic Preservation Society "Deltic Deadline", from April 1985 to December 1988. 3 - "Deltic Deadline" October 1984.